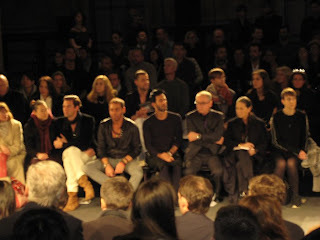 I'm not much of a celeb stalker,* but when I got to standing room on a riser in the New York Public Library and saw what looked to be Marc Jacobs front row at Victorinox, I must admit to a lot of picture taking. Oh, well, it's my first, close-up Marc sighting post-rehab & gym. Years ago I passed him standing on his doorstep at his Soho store and thought he looked so cute with his glasses and kind of nerdy, normal-body look. Marc+friends who appear to be wearing slouchy suede boots and lots of visible chest. And maybe a tube top. 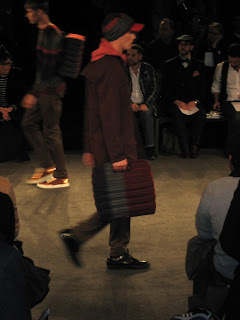 Mr. Jacobs intently watched the show, the debut 1909 Victorinox collection of his friend, Pierre Henri Mattout. 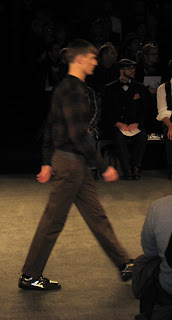 And for good reason, this men's collection is very appealing and deserving of many serious, intent looks. While watching, I thought "urban sporty nerd." It was a lot more than that, as can be read here. 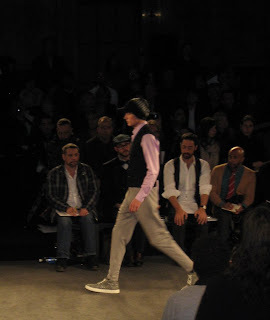 But M. Mattout gets my vote for best inspiration for NYFW Fall '09: "rumspringa" Amish teens hanging in Times Square. Yes, a solid theme. 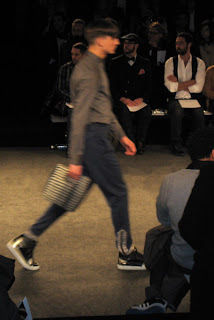 Which explains why this collection seamlessly blended nerd + sneakers + puffy jackets. Amish nerdy, kind of nerdy. And looks like my camera is dying. Want, want the tennis shoes, and jacket on left. Really I'd wear a lot of this collection. 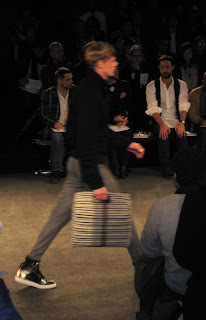 Dear Heterosexual Man: Just give in, carry a chic bag already. You don't have to fight it anymore, it's beyond your control. The bag brigade has overrun you and yr. messenger bag. *unless you are Prince, LeBron James, Chad Pennington, Ghostface Killah, or a Marley brother, esp. Damian. I thought they made knives! Collection is not very masculine. Don't like it. 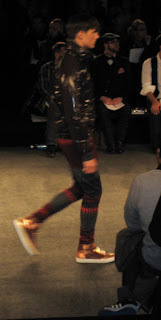 Is it weird if I'm drooling over a blurry picture of Marc Jacobs? Haha... I like this collection though. I like it more than some of the women's collections I've been seeing. Hmm. Y3 knock off? Yohji does it much better. kati - forgot! yes, ALT too! anon - swiss army watches, etc. farren - agreed. much more interesting than women's collections. sad that my camera shoots mainly blurry these days. anon again - my pictures don't represent the full frontal amishness.